I have been raving about Disney and Pixar's newest dvd release since I first saw the trailer over a year ago. My friend Amanda sent me a link and said "You're going to want to see this movie. Watch this." From that moment on the movie has not been too far from my mind. 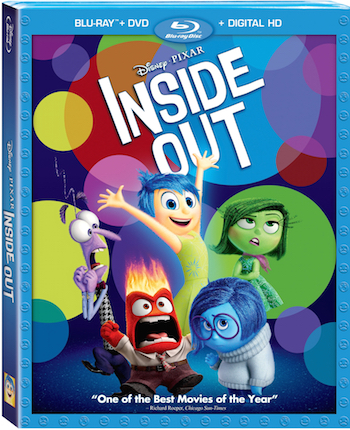 Inside Out came out on DVD/Blu-Ray Combo this week! I could not have been more excited to share this movie with my children. Allyson and I went with our Girl Scout troop to see the movie, but sharing it with Cooper was a nice treat in itself. It was a really great experience to see this movie with 8 little girls and their parents. Of course we discussed their favorite characters after it was over. Allyson's favorite was Anger. Anger won for her because his hair catches on fire. We even earned a patch for discussing our emotions and actions. It was a really great experience. That however isn't the end of our Inside Out story. Joy is my favorite character. I think there is a reason for this. She is bubbly and always trying to find the greatness in things. Always looking for the point where the situation can be happy instead of sad, disgusting, full of fear, or even turned to pure anger. Let's not blow our tops here. Joy keeps everyone together until well, she gets sucked up with Sadness and thrown to the archives. I don't want to ruin the movie for you but Joy is my hero! She stays positive through everything and manages fix things, but not without the help of her friends! While Joy is being awesome and positive in the movie, I am working through life like that. I rely on my friends and try to find the happy in every situation. Life would be boring uneventful not fun if I sat around moping in the corner every day! So, we push forward with Joy and slap that smile on our faces, right? Sometimes we even throw our arms in the air and act like Joy!! If you are among the few people that have not purchased your copy of Inside Out, I urge you.. Please do so. Share it with your children, nephew, neighbors, the random people down the street... Anyone! Everyone should experience what goes on at Headquarters and get to know Riley. A little treat for you... Watch all new Pixar Short Clip -- Riley's First Date!! I love this movie and think it should be in everyone's home. Of course you have probably picked up on that from my words, but really. Pick up Inside Out and place it under your tree this holiday season. Your children will thank you! Wait, there's a giveaway!!! 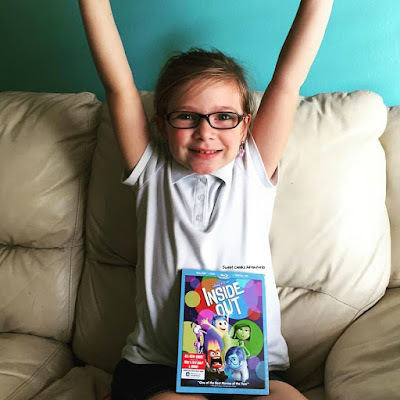 Enter to win a Digital HD copy of Inside Out below! Oh my gosh, I can't wait to see this movie, thank you for the wonderful review it looks like it was such a good and cute movie! We have seen this movie too many times to count, it has definitely become a fave in my home. I hear there is also a short, Rileys first date... I haven't seen it yet, but I'm sure it's interesting with all those feelings lol. I honestly feel like I might be living under a rock or something because I have never heard of this, before! I am going to definitely check it out now, though, so thanks! I'll let you know what I think of it when I get to see it!! I have watched inside out approximately one thousand times since buying it two weeks ago. My favorite character is Joy because I am constantly searching for her motivation in my own life. Sometimes I'm tired and exhausted and sleepy lol but I try to make life fun. I have not seen it yet,hoping to win so I can watch it with my grandsons. I haven't seen Inside Out yet. My daughter and I went to see it but it wasn't playing in our theater for some reason. We saw Hotel Transylvania 2 instead. I haven't seen it,but I would love to watch it with my grandsons. I haven't seen this movie yet but I really want to! Haven't been able to see it but my kids loved it. No I have not seen it but my kids have heard their friends saying it was really good!! I have not seen it, but would love to!! We have not seen Inside Out, but it looks interesting and would like to see it! know they have been asking me to watch it with them.